CONGRATULATIONS TO THE ARADIA ENSEMBLE FOR THEIR 2016 JUNO NOMINATION FOR CLASSICAL ALBUM! 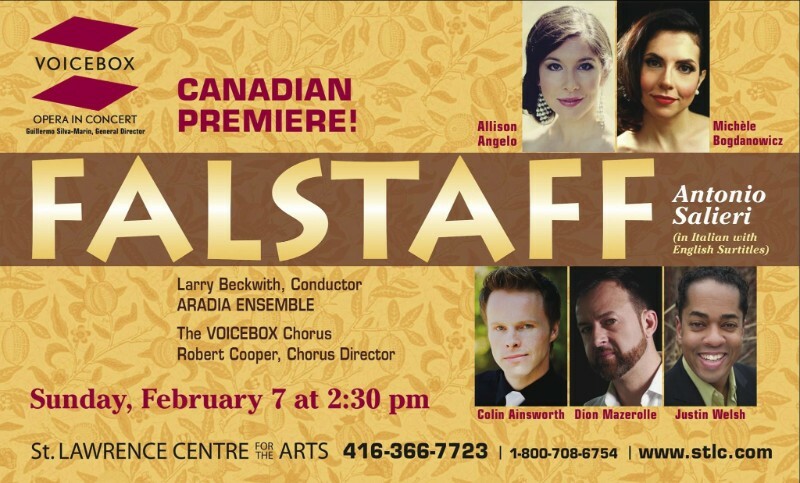 This Sunday, February 7, 2016, Larry Beckwith helms the Canadian Premiere of Salieri’s FALSTAFF, leading the recently Juno-nominated Aradia Ensemble, cast and as always Robert Cooper C.M. leads the VOICEBOX: Opera in Concert Chorus. Known mainly as Mozart’s rival, Salieri was one of the most popular opera composers of his day and FALSTAFF is recognized as possibly the very first opera based on a work by William Shakespeare. Salieri’s operas were internationally acclaimed during his lifetime and he was the renowned head of the Italian opera house in Vienna; later in his life, he taught Beethoven, Liszt and Schubert among others. The all Canadian cast includes Dion Mazerolle as Sir John Falstaff—who has just been interviewed by our friends at Schmopera, Allison Angelo as Mistress Ford, Colin Ainsworth as Master Ford, Michèle Bogdanowicz as Mistress Slender and Justin Welsh as Master Slender, and new generation artists making their debut with OIC Sydney Baedke as Betty as well as Diego Catala Bardolfo who OIC patrons will remember from last season as the stern and commanding Frank Maurrant in Street Scene. Last month, the West Side Chamber Orchestra, its founder Kathy Halvorson, its conductor Kevin Mallon, and contemporary harpsichordist Christopher D. Lewis kindly allowed us to be present for the final takes of an upcoming Naxos album. Before conducting the inaugural concert of the West Side Chamber Orchestra at St. Peter’s Church in Chelsea on Saturday evening Kevin Mallon said he had been amazed — given the struggles of many orchestras to survive — to receive a call from the oboist Kathy Halvorson about founding a new ensemble. That Ms. Halvorson and Mr. Mallon had to pay for the concert themselves attests to the fiscal challenges of starting a new arts organization. None of the professional musicians (including the piano soloist) were paid for Saturday’s event. The orchestra’s mission is to present works from the classical period on modern instruments in a historically informed style, although for Mr. Mallon, a protégé of the early-music specialist John Eliot Gardiner, “authentic is a dangerous term.” He writes in the program book that “we cannot allow a pedantic viewpoint to limit the approach to the music,” noting that in an 18th-century orchestra some musicians might have performed on “period” instruments and others on more modern versions. 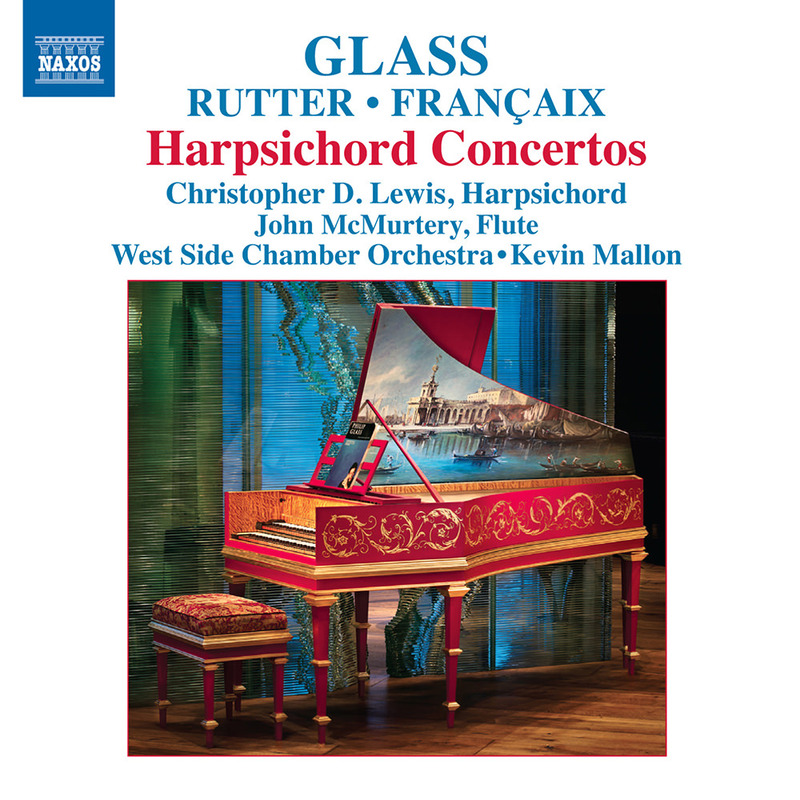 One hallmark of historically informed performances can be breathless speed, which this new ensemble avoided in the spacious tempos of its polished and elegantly shaped interpretations. The program opened with the Symphony in F (Op.3, No. 1) by Franz Beck(1734-1809), which Mr. Mallon has recorded with the Toronto Chamber Orchestra for Naxos. The West Side ensemble, some of whose string players held their bows in the baroque style, offered a spirited performance of this vivacious symphony, illustrating its dramatic hues and rich harmonic language with transparent, buoyant playing. Mr. Mallon also wrote in the program book that to avoid seeming self-indulgent and romantic, early music specialists sometimes avoid “tempo rubato,” a term often used in the late 18th century that refers to a slight, temporary change of tempo for expressive effect. In Mozart’s Piano Concerto No. 20 in D minor (K. 466) the pianistFrancine Kay had no qualms about using plentiful rubato, especially in the cadenzas by Beethoven. Her comparatively romantic approach and tendency to milk phrases contrasted with the lean, tauter orchestral playing. She often performed with warmth and insightful touches, but a more sparkling sound might have better complemented the ensemble’s interpretation. The program concluded with a lithe, polished rendition of Beethoven’s Symphony No. 1 in C, which alludes to the 18th-century traditions of Mozart and Haydn while also breaking new ground. The West Side Chamber Orchestra is based in New York City’s West Side. Founded by the oboist Kathy Halvorson, this new orchestra is a collection of the city’s finest classical musicians, banding together in a bold initiative to counter a faltering work environment. Greeted with critical praise after its inaugural concert in September 2011, the orchestra plays all periods of music, from baroque to modern (including new commissions), but is making a speciality of the classical repertoire of the Enlightenment period. The approach is to extend to all periods of music the lightness, transparency and purity of tone it has achieved in the earlier repertoire. Under the influence and leadership of the enthusiastic Irish conductor Kevin Mallon, the orchestra presents a series of concerts in the historic St Peter’s Church in Chelsea, New York City. The orchestra is proud to have released its first recording with Naxos. 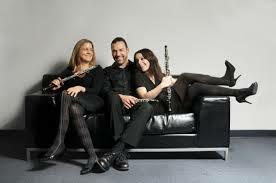 THREEDS is a New York City based oboe trio that includes Kathy Halvorson, Katie Scheele and Mark Snyder. The three musicians (usually two oboes and an English horn) have performed in some of New York’s most prestigious chamber music venues including Trinity Church @ Wall Street’s “Concerts at One” series; “Music for Summer Evenings” at the Grace Chapel in Silver Bay (Lake George), NY; and at the Good Shepherd Church in Brooklyn, NY. The trio enjoys exploring a wide variety of music from all musical time periods and from all corners of the world. The members of THREEDS have also arranged music to accompany several local singer-songwriters (including Amber Rubarth, Adam Levy and Alex Berger) and have been featured at several downtown NYC music venues including Joe’s Pub, the Living Room, the Rockwood Music Hall and Pete’s Candy Store. Threeds are the NYC’s MTA’s newest Music Under New York artists, which means you may be hearing them in the subway sometime soon! Threeds has just released their debut CD, “Unraveled”. You can purchase it on iTunes, CDbaby, and CDuniverse!! Individually, each of the oboists in THREEDS are accomplished freelance musicians and have played in many prestigious orchestras including the Rotterdam Philharmonic, the Richmond Symphony, Cork Opera, the Key West Symphony, the Albany Symphony, the Moscow Chamber Orchestra, the Reading (PA) Symphony, the Westchester Philharmonic and the Long Island Philharmonic. Members of THREEDS have also performed on Broadway shows, played on several popular music albums and on Emmy nominated independent film soundtracks. Latest review of our CD, “Unraveled”…. The idea of a band with three oboes and not much of anything else is pretty awesome in itself. 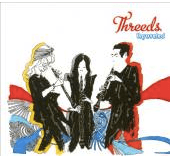 Add an irrepressible sense of humor, a penchant for rearranging familiar tunes in unfamiliar ways, and three players with chops as soulful as they are technically impressive, and you get the Threeds oboe trio. Their new album Unraveling is pure joy – except when it’s bittersweet, or sad, or even haunting, as it is much of the time. Much as Kathy Halvorson, Mark Snyder and Katie Scheele have a great time rearranging Michael Jackson, Stevie Wonder, Bjork and others, this is as about as far from a joke record as you can get. Can you say cutting-edge with a smirk? On the opening track, Joga, they find Bjork’s plaintive inner baroque soul. Their cover of Billie Jean has a bass clarinet playing the bassline perfectly deadpan and mechanical, with the trio in perfect alignment. In the beginning, the arrangement really nails the cold, heartless precision of the original; as it goes on, it’s impossible to escape the context, and becomes just plain hilarious, especially when two of the oboes do those staccato backing vocal lines. Best yet, you can download it for free. While the version of Stevie Wonder’s Superstition also has the bass clarinet playing the bassline, it swings, and so do the oboes – it’s blissfully funky. In a pretty stark contrast, Paranoid Android gives Radiohead’s crazy cyborg some real humanity – when it segues into a restless march, it’s one of the most unaffectedly intense moments on the album. Goodbye Pork Pie Hat begins as a duo, with Scott Anderson on acoustic guitar and Halvorson playing Mingus’ sad, bitter lead lines. It’s a potent reminder that Mingus wrote the song as an elegy for Lester Young, the bass clarinet’s sustained lines underscoring Halvorson’s understatedly wounded, blues-infused phrasing. Light My Fire has drums, percussion, and tambourine along with bass clarinet – it works as well as it does because Manzarek nicked a Chopin riff for it! The spiraling bop oboe at the point where the organ solo kicks in is pretty hilarious, and absolutely spot-on. The most intriguingly complex arrangement here is the series of lushly intricate, shifting segments in the suspenseful, nocturnal Spanish Stairs. Dospatsko Horo is the Balkans done as baroque – it doesn’t quite turn the party into a wake but it’s definitely a radical reinvention. Hoagy Carmichael’s Skylark also gets a radical reinvention, in this case as riff-driven 21st century circular music.The other tracks include the classic tango El Choclo done as a brooding yet sprightly baroque round; Oblivion, a bolero-flavored pop ballad; Little Feat’s Roll Um Easy, which surprisingly hits a mellow early 70s Allman Brothers vibe, soaring oboes enhancing the blue-sky ambience. The only track here that’s not worth uploading is not the band’s fault. This works on so many levels – as party music, as a monster ipod mix and as sophisticated 21st century stuff. Look for this one on our best-of-2011 list at the end of the year.